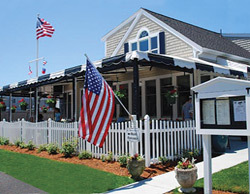 This casual waterfront restaurant, perched right on Hyannis Harbor, just had a major facelift. The new look is all about upscale nautical, and the new menu offers an extensive selection ranging from burgers, salads and taste-tempting appetizers to fresh native seafood, with plenty of alternatives to keep everyone in the crowd happy. What could be better than eating fried clams on the patio while watching boats sail in and out of the harbor? Entertainment year round in the lounge. Hours: Daily, 11am to close.